Today, on the 53rd anniversary of the Tibetan National Uprising Day and the fourth anniversary of the 2008 mass protests in Tibet, I offer tribute to the brave people who have sacrificed so much for Tibet. Despite fifty-three years of occupation by the People’s Republic of China (PRC), the Tibetan spirit and identity inside Tibet remains unbroken. On this occasion, I pay homage to His Holiness the Dalai Lama for his vision, leadership and benevolence. I also pay my deepest respect and gratitude to our elders for their contribution and tireless effort that have sustained our movement’s growth and dynamism over the past fifty years. One year ago, when His Holiness the Dalai Lama announced the transfer of his political power to a democratically elected leader, Tibetans were apprehensive and implored him to reconsider. Today, the world recognizes and applauds His Holiness’ vision and magnanimous decision. Tibetans are making a smooth transition with the free, fair and multi-candidate 2011 parliamentary and Kalon Tripa elections that involved exile and diaspora Tibetans in over forty countries. I am also enormously moved by the solidarity and endorsements from Tibetans inside Tibet during the elections and since assuming my political post. I have had many deeply moving encounters with hundreds of Tibetans from Tibet as they generously offered their blessings and support. Blessed by the historic transfer of political power from His Holiness, empowered by the mandate received from the people, and buoyed by the support and solidarity from Tibetans inside Tibet, I can say with pride and conviction that the Central Tibetan Administration legitimately represents and speaks for all six million Tibetans. Beijing’s view that a generational change in leadership may weaken the Tibetan freedom movement has not and will never materialize. The resiliency of the Tibetan spirit combined with a coming generation of educated Tibetans will provide dynamic leadership and sustain the movement till freedom is restored in Tibet. If the Chinese government’s claim that Tibetans enjoy freedom and equality are true, then it should allow democratic, transparent, free and fair elections in Tibet. In the fifty-three years of Chinese occupation, no Tibetan has ever held the Party Secretary post of the so- called Tibet Autonomous Region (TAR). Chinese hold majority of the decision-making positions in all branches of the government and constitute more than fifty percent of the public sector workforce. Seventy percent of the private sector enterprises are owned or operated by Chinese. Forty percent of Tibetan high school and college graduates are unemployed. The Tibet issue concerns far more than the rights and welfare of six million Tibetans. It impacts the entire planet. The unique Tibetan culture, with its rich language, spirituality and history must be protected. The Tibetan plateau is the ‘world’s third pole’ as it contains the largest ice fields outside the two poles. Tibetan glaciers, the source of ten major rivers, affect the lives of more than 1.5 billion people. Billions of dollars worth of mineral resources are exploited annually to fuel China’s economy. Decades of logging have reduced Tibet’s pristine forest cover by half. Clearly, the management of this global common, and the Tibetan people’s traditional role as its stewards, ought to be a planetary concern. When China invaded Tibet in 1949, it promised to usher in a ‘socialist paradise.’ In actuality Tibetans are treated as second-class citizens. When Tibetans gather peacefully and demand basic rights as outlined in the Chinese constitution, they are arrested, fired upon and killed as in the January 23-24th peaceful protests when Chinese were celebrating their new year. The Communist Party cadre members in the TAR have been ordered to prepare for a “war” against the Tibetan protestors. In stark contrast, in Wukan (Guangdong Province), protests by Chinese people lasted weeks, their grievances were addressed, one of the protest leaders was appointed in a leadership position for the village, and provincial authorities even supported free village elections. 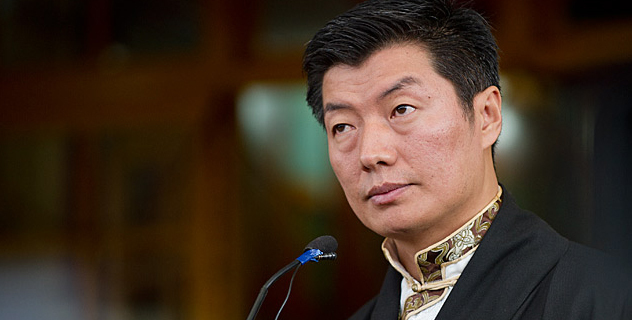 Intellectuals, artists and leaders in Tibet are being arbitrarily arrested and imprisoned. Thousands of pilgrims recently returning from India have been detained and many have disappeared. Tibetans, including monks and nuns, are forced to denounce the Dalai Lama and attend patriotic re-education classes. Foreigners and international media are barred from Tibetan areas. A Chinese scholar recently observed there are “more Chinese than Tibetans, more police than monks, more surveillance cameras than windows” in Lhasa, the capital city of Tibet. The entire region is under undeclared martial law. China has built many airfields in Tibet, stationed many more divisions of the PLA, begun expanding the railway line to the borders of neighboring countries, and dispatched thousands of paramilitary forces into Tibetan areas. Tibet has become one of the most militarized areas in the region. The Tibetan struggle is not against the Chinese people or China as a nation. It is against the PRC government’s policies. China must acknowledge the depth of the problems in Tibet and understand they cannot be solved through violence. To address the tragedy in Tibet, I call on Beijing to accept our Middle Way Policy, which seeks genuine autonomy for Tibetans within the framework of the Chinese constitution and as proposed in the Memorandum and Note of 2008 and 2010 respectively. Hong Kong and Macao have been granted high degree of autonomy. Despite resistance from Taiwan, China has offered Taiwan more autonomy. Why are Tibetans still not granted genuine autonomy as stipulated in the Chinese constitution? We hope that China’s upcoming leaders will initiate genuine change, and that they find the wisdom to admit the government’s long- standing hardline policy in Tibet has failed. We have chosen to move down a mutually beneficial path even though Tibet historically enjoyed independent status and Tibetans have the right to self-determination according to international law. Concerned Chinese citizens and intellectuals should make an effort to seek the truth and understand why Tibetans are protesting and self-immolating. Dialogue and a peaceful resolution to the Tibet issue are in the best interest of China, the Chinese people and Tibetans. We stand ready to send envoys to resume the dialogue process even though the Chinese envoy belonging to the United Front Work Department has of late invested far more energy traveling around the world and making outrageous attacks on His Holiness the Dalai Lama and the CTA led by the Kalon Tripa. In the process they have actually further internationalized the Tibet issue. A key reason for creating the United Nations was the pursuit of human rights. I urge the UN to live up to its objective and address the crisis in Tibet by appointing a Special Rapporteur and visiting Tibet. The international community and media must send a fact-finding delegation into Tibet to remove the veil of censorship and disinformation campaign. “Even Pyongyang (North Korea) has an international media presence, which is not the case in Lhasa,” says Reporters Without Borders. I appeal to the officials and member states of ASEAN and SAARC to include the Tibet issue in your agenda given Tibet’s geopolitical and environmental significance affecting billions of Asians. A China that is able to address the Tibet issue will make it a more peaceful neighbor and contribute to harmony and stability in the region. To my fellow Tibetans, now is the time to show solidarity and support with our brothers and sisters in Tibet. We must give education top priority so that educated and community-minded Tibetans will provide dynamic leadership and sustain the Tibetan movement till freedom is restored in Tibet. The Kashag would like to request that mantras and prayers be recited every Wednesday for those who have sacrificed their lives for the Tibetan cause. Younger Tibetans should embrace and celebrate our proud heritage and identity by wearing, speaking and eating Tibetan every Wednesday. Let us make 2012 a Tibet Lobby Year. In this Tibetan New Year, I call upon all Tibetans and friends to reach out to elected representatives at the state and national levels in your countries. Invite and educate them about Tibet and the efforts of His Holiness the Dalai Lama and the CTA. Generate debate about Tibet and get legislations passed in support of Tibet and the Tibetan people. Initiate activities that raise the profile of Tibetan democracy and visibility of Tibetan political leadership and the CTA. The fourteenth Kashag will make maximum efforts to realize our larger goal, as well as take steps to prepare the Tibetan people and institutions for the 21st century under the guiding principles of unity, innovation and self-reliance. The Kashag again urges all Tibetans and friends participating in various solidarity activities to ensure that the activities are undertaken peacefully, in accordance with local laws, and with dignity. Please remember non-violence and democracy are two of our constant principles. The Tibetan people and current Kashag are extremely blessed to have the continuing presence and wisdom of His Holiness the great 14th Dalai Lama. The Kashag extends absolute support to the historic statement issued on September 24, 2011 by His Holiness concerning his reincarnation. We believe His Holiness alone has the right to determine his reincarnation, and that the communist government of China has absolutely no say or role in this matter. I would like to take this occasion to thank all governments, especially the governments of United States, Europe and Asia, organizations, Tibet Support Groups, and individuals who have supported the Tibetan people. Your support is greatly appreciated. I also call on our old and new friends alike to reinvigorate the Tibet Support Groups around the world. We need you more than ever at this critical time. The Kashag would also like to acknowledge the full cooperation of the Chitue Lhentsok and looks forward to a productive partnership in serving Tibet and Tibetan people. I am also happy to express the Tibetan people’s deepest and continued gratitude to the government and people of India for their generous hospitality and kindness over the past five decades. My appreciation has grown tremendously since becoming the political head of the Tibetan people. Hardik Shukriya! Lastly, to our dear brothers and sisters in Tibet, we would like to say that you are in our hearts and prayers every day. We will walk side by side with you till freedom is restored for Tibetans and His Holiness the Dalai Lama returns to Tibet. I pray for the long life of His Holiness the Dalai Lama. May our long cherished goal of freedom and reuniting in the Land of Snows be realized soon!